"What is rain? It is like Christ Who was also sent by the Father from Heaven to water a thirsty earth." He is called the St. Bishop Nikolai of Ohrid & Zica, and also, "The New Chrysostom"
Milana Karlo Bizic at the Bishop Nikolai Museum in Lelic, 2008. Many of the photos in the museum were taken by my father, Milan M. Karlo. There were also articles Milan Karlo wrote on +St. Bishop Nikolai in the American SRBOBRAN and the Diocesan OBSERVER. It was a treasure trove of history! L-R are Mr. Jovan Bratich, Serbian Section of the American SRBOBRAN, Mr. Risto Seslija, Administrator Editor of the SNF, Mr. Mileta Milanovich, Secretary of the SNF, Mr. Milutin Devrnja, editor of the American SRBOBRAN, Proto Fr. Vlastimir Tomich, Peter Bizic from Ambridge, PA, and Sava Vujinovich, Treasurer of the Serb National Federation. Bishop Nikolai had eight brothers and sisters, but all perished in WWII. Bishop Nikolai himself, was a prisoner of Dachau. The children also learned what a well-educated man Bishop Nikolai was, holding FIVE doctoral degrees, and speaking SEVEN different languages! The first Doctorate of Theology was in Berne, written in German and published in Switzerland, and later translated into Serbian. He received his Doctorate of Philosophy at Oxford, England, and his 2nd dissertation was written in French! He was awarded a Doctorate of Divinity from Cambridge University after speaking about his suffering Serbian people during the war. Because of his academic excellence, he received an Honorary Doctorate of Divinity in 1919 from the Unversity of Glasglow in Scotland. In 1946, he received his fifth Doctorate of Sacred Theology from Columbia University in June 1946 for his academic excellence. He spoke at a full house at the Carnegie Music Hall as an honored guest. Others were worried. "What are you going to say and do? These people know nothing about the Serbs." When he went on stage, he asked that the lights all be turned off except for a spotlight on the stage, for FIVE whole minutes. Then he quietly took out his frula (flute) and played it. Then he picked up the gusle he had and sang with the screeching sound machine, never stopping or saying anything until the five minutes were up. +V.Rev. Fr. Dr. Mateja Matejic, protopresbyter-stavrophor, from Ohio State University and founder of the Hilandar Research Library in Columbus, OH, wrote an excellent review of the new book entitled UNKNOWN LETTERS OF SERBIAN SAINT NIKOLAI by Zeljko Jelich in the American SRBOBRAN on Wednesday, Oct. 7, 2009. Fr. Matejic's article was entitled "Saint Nikolaj of Zicha and Ohrid About General Draza." Before Jelich's wonderful new compilation, Fr. Matejic said, only 32 known letters had ever been published. "The spiritual and literary wealth of Saint Nikolaj of Zicha and Ohrid, which he left to the Serbian people, is inexhaustible. "Nikolaj evokes memories from his and Patriarch Gavrilo's incarceration in the concentration camp Dachau. Published in Zeljko Jelich's new book are letters addressed to: Winston Churchill; Herbert Hoover and his reply to the Bishop; Slobodan Jovanovich; 22 letters to Dr. Dimitrije Najdanovich and his wife Jelena; 5 letters to Dr. Rajko Djurdjevich, and in the Appendix, Bishop Nikolaj's letter to Dragisa Cvetkovich and his reply to Bishop Nikolaj are published." Dr. Mateja wrote: "Of special importance is Bishop Nikolaj's letter to Winston Churchill, written on March 27, 1946, the fifth anniversary of the beginning of the tragedy of Yugoslavia and Serbia in particular. In the letter the Bishop first reminds Churchill of their conversation held on the ship Queen Elizabeth and of his speeches in the USA, 'Olympian in style and clarity, but Christian in spirit'. Then he begged Churchill to intercede in favor of General Draza Mihailovich, who 'is to the very core a Christian believing man.'" "General Mihailovich will most probably be shot. But you know death is not the end of a man. The dead, especially the righteous dead, are even more powerful than the living ones, and I am sure the General, having been in this world the most faithful to his Lord and to his people and to the Allies, will plead his cause before the righteous God. His blood will fall upon those who are guilty for his death. For we Christians see in the blood of a man not only 'red water' as the totalitarian unbelievers do, but a terrible mystery. The Bible, which is frequently quoted in the British Parliament teaches us that the blood of innocents cry to God for revenge. And I certainly would not wish that a drop of the General's blood should fall upon you and your posterity. Therefore, I beg you to raise your voice, as soon as possible, and say the truth about General Mihailovich." Fr. Matejic goes on: "Then the Bishop defended Draza Mihailovich with words, painting his image with unparalleled love and respect:"
"Plead for the unjustly and mistakenly abandoned leader of a nation who is now standing very close to death and eternity. "May I help you with some description of General Mihailovich's character? "He is to the core a believing Christian man. During the German occupation, he visited our ancient sanctuaries secretly, and asked the priests to pray for him and the people who were with him. He relied upon the Lord. He had some clergymen with him who performed church services as often as the circumstances permitted, and they all said grace at meals. "He went by night to Holy Communion frequently, and he advised others with him to do the same. He issued orders to his soldiers to lead a clean Christian life repeating often to them: 'We are the Crusaders fighting for the Holy Cross and Freedom as our forefathers have done for centuries. "He is a real man of the people. The Masses of our people have been looking to him as the incarnation of what is considered the BEST in our national character, in our soul and conscience, in our national as well as our church history. There are instances recorded when men willingly went to their death in order to save his life. Such was and still is, the enthusiasm of a suffering but honest people toward their honest leader." "But even in this second period when the Allies attacked his troops from the air, as I am told, and killed his soldiers, he issued the order that not a single gun should be fired against the English, Americans and the Russians." Letter from Bishop Nikolai to my father, Milan Karlo, editor of the American SRBOBRAN, July 25, 1953. Hoping that this first translation of mine into English of "Lucha Mikrokozma" (The Rays of the Microcosm by Bishop Petar Petrovich Njegosh), I send you a copy. Three greatest seers and visionaries in the XIX century were: Milton, Klopstock and ourNjegosh. His stupendous travel through the space of the created universe to its utmost limits,and far beyond that ----- beyond space and time----- into spiritual worlds will, I am sure,excite your admiration. Forget, please, about my photographs--nothing doing and no importance. I admired your article on Draza. Excuse only my little remark: you write "The Turks burned the body of the miracle-creating St. Simeon, the father of St. Sava" etc. As a fact, described inmy book THE LIFE OF ST. SAVA, it was the body of S. Sava which was burned on Vrachar in Belgrade,not of St. Simeon. St. Simeon's (Nemanja's) body is lying in the monastery Studenitza, whole and undestroyed until this day. Best greetings to you, Mr. Sokich and Mr. Bratich. (Aside: My Dad, Milan Karlo, can be forgiven for mixing up St. Sava and his father, as Milan was born in America to hard-working but poor immigrant parents and had never traveled to Serbia. (Neither did his strong Serb parents ever travel back to Europe. They came from Primishlje, in Kordun, of the Vojna Krajina area-now "Croatia".) In 1953, there was no computer or Internet with information on demand at your fingertips. Hitam i pre vremena da tebi i Poli cestitam veliku roditelsku radost, a mladencima, sinui snaji da po`elim svaku dobru srecu od Boga. Daj Bog da ubrzo docekate da i Jovu o zenite. I rush, ahead of time, to congratulate you and Pola on a great parental joy, and to the newlyweds, your son anddaughter-in- law to wish good luck from God. May God grant that soon your son Jovan will also marry . Sinoc sam govorio s protom Miloradom. Po tom pisao sam mu, da `alim da ne mogu docina vasu panortdoksnu priredbu. Ne mogu, inace veoma cenim takve molitvene sastanke;kroz njih se unapreduje "edinenie vsjeh" a ne utiru se nacionalni ideali i karakter. Obecao sam ti javiti se posle sastanka sa delegacijom u Njujorku. Jedina mi je korist sto sam se obavestio o stawu Crkve i pojedinim svestenim licima, te sad imam popunjenu,jasniju sliku. Oni su licno dobri ljudi, od dugog robovanja neveseli, i kao nesto pritajeniu pogledu faktickog cilja dolaska. Ja sam im rekao odnosno jedinstva Crkve ono sto i tebi:jedna snazna zajednica ne deli se. Crkvu u Diaspori treba duhovno i moralno osnaziti pase ne bojati cepanja. Neka nam je Hristos Gospod na pomoc. A da bi nam On pomogao, potrebnoje i svestenicko i svenarodno pokajanje s vapajnim molitvama. Zato ja ipolazem mnogo nazajednicku molitvu u Midlandu. Ako mi budes pisao, javi mi da li jeSava Vujnovic jos u Savezu i radi lina kalendaru. A Milan pozdravi. Snazn i ....dusni opis srpskogmucenistva je dao - da and|eli zaplacui mene poprskaju. Last evening I had conversation with prota Milorad. After that I wrote to him that I regret my not being able to come to your pan-orthodox event. I cannot, otherwise I greatly appreciate such prayerful assemblies through which is promoted the unity of all without erasing national ideals and characteristics. My only gain is that I obtained information about thesituation of the Church and some clergymen, so that now I have a fuller and clearer picture. Personally, they are good people, sad because of the long-slavery and somehow secretive concerning the concrete reason of their visit. Regarding the unityof the Church, I told them the same I have told you: a strong community does not split. The Church in Diaspora should be helped spiritually and morally. And then there is no reason to fear. May the Lord Christ help us. In order that He would help us the repentance of priests and entire people with tearful prayers are necessry. That is a reason I put a lot of trust in the joint prayer in Midland. Juce sam poslao preko tebe pismo za g. Ducica. Ti ces svakako bitina zboru S.N.O u Pitsburgu. Pozeleo sam im uspeh. Molim se Bogu da samobudu u slozi u S.N.O. Voleo bih cuti od tebe, kako je zbor prosao. Jedan ovdasnji Srbin bio je u Midlandu na svepravoslavnoj priredbi. Bila je kisa, veli, pa malo naroda. - To ne treba da obeshrabri. Sve veliko pocinje se sa malim. Sve mi se cini, da sam opteretio brata Mila Vujinovic. Pozdravi ga,molim te, i reci mu, da ako nema vremena za prepisivanje onog mog Ms. neka gapreda tebi na tvoj sud i cuvanje. Nimalo se na njega necu ljutiti. Razumem ja njegov polozaj. Prota Aleksa izadao je vrlo lep kalendar za -52 godinu. Ako nisi dobioja cu ti poslati. Sv. Nikolu proslavicu, ako Bog da, u Nujorku. Od tvoje strane pozdravicuBogdana. Yesterday I sent to you a letter for Mr Ducich. You are most likely going be at the meeting of the S.N.O. I wished them success. I pray God that they in the S.N.O. be in unity.I would like to hear from you how the meeting went. One Serb from here was in Midland for the pan-Orthodox affair. It was raining - he said,and there were few people. That should not be discouraging. Everything big starts with the little. It seems to me that I have overburdened brother Milo Vujinovic. Please give my regards to him, and tell him that if he has no time to copy that Ms., let him give it to you for your evaluation and safe-keeping. I am not and will not be angry with him. I understand his position. Prota Aleksa has published a very beautiful calendar for the 1952 year. If you haven't received it yet, I shall send one to you. God willing, I shall celebrate St. Nicholas in New York. I shall give your regards to Bogdan. Ljubazni mi proto Vlasto,Bog ti na pomoc. Juce poslah ti neko pisanije, a po tom primih tvoje bas ono sto sam zeleo: opis smrti pok. prote Zike.- Ja sam ga uvek zvao svestenik dzentlmen. Adzentlmen nije isto sto i gospodin. Gospodin je Mister, a gentleman =noble man,plemic. Takav je plemc bio mili nas o. Zika. U svakom potezu, i u reci iu ophodjenju, i u poslu, i u prevelikom covekoljublju, i najzad - kako mi pises,cak i u mrtvackom sanduku. I tako od jula do Vavedenja Crkva srpska izgubi (bar uovom svetu) tri znamnita protojereja: protu Marka, protu Stevu Dim. i protu Ziku. Hvala ti na tvojoj "top reci". Samo kako ti znas i umes. i neka bude srpsko dvodnevno praznovanje i veselo i tuzno. Secas li se ti, Vlastomoj, moga napisa: Hramovi srpskim mucenicima, u kome sam molio Srbe da svuda posvetu posvecuju nove hramove Srp. novo mucenicima? Niko se ne odazva. A brat Dion.na suprot tome povika, da sve nove hramove treba posvet. - sv. Savi!. Ja sam uveren,da se i sv. Sava na onoljuti. Kao otac nacije, on bi se samo radovao da njegova duhovna cada budu proslavljana i u ovom svetu kao sto su i u onome. Ne znam kako ce biti s tvojim predlogom skromnijim i obicnijim. Valjda ce Srbito primiti k srcu. Hvala ti sto si bio voljan da me pozoves u goste. Ja sam kod tebe dosta gostovao. Pre dve i po godine zeleo sam doseliti se u tu tvoju okolinu, jer nisam znao kuda cu,posto mi je u Njujorku bilo dodijalo a u Libertivilu jos gore. Mislio sam da senastanim u onoj kuci na groblju. Ali, to se nije prihvatilo. Onda me je Gospod uputiona ovo mesto, gde imam i posao i tisnu. Hvala tvom Miru na pesmi nad odrom +Zike. Pazi i cuvaj Gospa Polu. Svi neka se staraju o njoj i pomazu je, narocito snaha. Sv. Nikolu proslavicu sa o. Mijom zajedno. A za Bozic bicu na drugim stranama. + My dear proto Vlasto, may God help you. Yesterday I mailed some writing, and then I received yours, just that what I desired: description of thefuneral of late archpriest Zika. I always called him a priest-gentleman. And gentleman is not the same as mister. Mister is a Mister, and gentleman is a nobleman. Such a noblemnan was our dear Fr. Zika. In every gesture, in word as well as in behavior, and in work, and in great philantrophy, and, finally - as you have written to me - in his coffin. And thus, from July until Presentation of Theotokos the Church has lost (at least in this world) three outstanding archpriests: archpriest Marko, archpriest Steva Dim.,and archpriest Zika. Thank you for your "top word". Just as only you know and can. And now about your article. I included Serbian martyrs in the calendar on Aug. 31 after ____and together with the Assembly of the Serbian Enlighteners and Teachers. The best day: and let the two-days Serbian celebration be happy as well as sad. 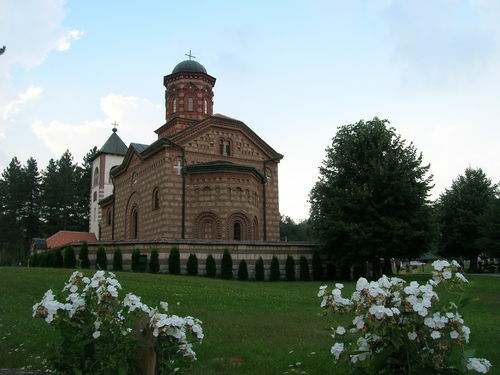 Do you remember, my Vlasta, my writing: Temples of the Serbian martyrs, in which I have asked Serbs to dedicate new temples throughout the world to the Serbian new martyrs. No one did it. And brother Dion. opposing it said in high voice that all new temples should be dedicated to - St. Sava ! I am convinced that even St. Sava is angry at that. As the father of the nation, he would also rejoice that his spiritual children be now celebrated in this world as they are in the other one. I do not know what shall be with your suggestion, more modest and more common. Perhaps the Serbs will accept it in their hearts. Thank you very much for your willingness to invite me to be your guest. I have been your guest enough. Two and a half years ago I wished to move in that surrounding of yours, because I did not know where to go, because I had enough in New York and even more in Libertyville. I considered settling in that house on the cemetery, but that was unaccpetable. Then the Lord brought me to this place where I have a job and serenity. Thanks to your Miro for the poem (read at the laying in state, MM) of +Zika. Watch and take care of Lady Pola. Let all take care of her and help her, and especially the dughter-in-law. I shall celebrate St. Nicholas together with Fr. Mija. And for Christmas I shall be in other places. Ovoga casa primih tvoje pismo, pa hitam da ti odgovorim pre nego sto Devrnja dodjek tebi, da bi obojica mogli rasuditi. Jer znam iako ste ublizu, retko se sastajete. Pisao mi je i on i Savo, pa sad i ti, da bi neke nase prvoklasne crkvene ljude trebalogrupisati na ono imanje. Kao da ne znate ko onim imanjem gospodari! cak i kad bi moglidoci ona dva sjajna narodna pastira, meni nije jasno sta ce oni onde raditi u sadasnjemstanju tog mesta! Osim toga, Devrnja mi je predlozio da pisem clanak u Srbob. Ali kljucece onihljudi, i mnogih mladjih uz njih, kao i pisanje ja bih ukljucio u jedan veliki pokret - nesamo za Ameriku - koji bi se, od prilike zvao Srpska Pravoslavna Akcija Spasnja. Samnogih strana guran na neku opstu spasonosnu akciju, i to vec odavno, ja sam nestosmislio - ne baspotpuno - pa bih potrebovao razgovora i dogovora i savetovanja. A otom ja ne mogu pisati ni tebi ni drugome. Zedan sam razgovora s vama. Aki nit ja moguk vama ni vi k meni - pa kako cemo? Udicki se pak zaposlio u W.J. pa i on nije sa mnom. Razgivor s D. opsirno, pa sta dokonate, javi. Milo mi je sto ti se Kosta javio. This moment I received your letter, and I haste to reply to you before Devrnja comes to you,that both of you could think over. For I know that although you are close, you seldom get together. He as well as Savo wrote to me, and now you, too, that our several first-class church-people should be brought together on that property. As if you do not know who governs that property! Even if those two excellent people's shepherds were able to come, it is not clear to me what could they do in the present condition of that place. Beside that, Devrnja has suggested to me to write an article in the Srbobran. But even the employment of these people and many others along with them, I would include in a largemovement - not only for America - which I would call approximately Serbian National Action of from many sides to some general action of salvation, I came to some solution - not final - so I am in need of conversations and agreements and consultations. And to write about that I cannot either to you or others. I am thirsty of conversations with you. But neither can I (come, MM) to you nor you to me. As for Udicki, he just got job in N.J. and thus even he is not with me. A detailed conversation with D. and whatever you come to. I am glad that Kosta got in touch with you. And if a man loses his soul, with what can he make payment, with what can he buy it back again? With nothing in the world. Not even if he gives the whole world can he buy his lost soul. The Bible was given not that we might judge it, but that it might judge us. "Every glimmering day," said Bishop Nikolai, "is another great day in the struggle of the two kingdoms." Which kingdom shall I choose? Shall I choose the earthly kingdom? Or shall I choose the heavenly? This question, posed to the martyred Tsar Lazar, whispers today in the hearts of all young lovers of godliness and sacrifice. The new sons and daughters of suffering Serbia are slowly coming to this place of martyrdom, seeking to attain the cutting edge in the place where the battle is fiercest and the crowns are eternal. The monastics laboring on the ancient battlefield of Kosovo have already made their choice: to die an earthly death for the sake of the Heavenly Kingdom. "Let us be ashamed of our slowness in thanking God when He gives, and of our quickness in grumbling at Him when He takes away." " Grant me the heart of Jesus, around which darkness waited in vain to enter, but never could." 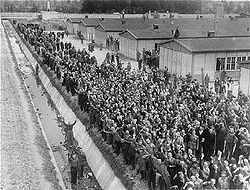 In the entire history of the Orthodox Church there has probably never been an Easter service like the one at Dachau in 1945. 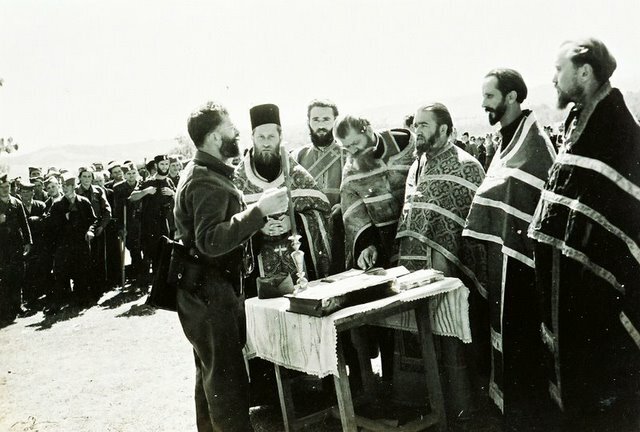 Greek and Serbian priests together with a Serbian deacon adorned the make-shift 'vestments' over their blue and gray-striped prisoners' uniforms. Then they began to chant, changing from Greek to Slavonic, and then back again to Greek. The Easter Canon, the Easter Sticheraseverything was recited from memory. The GospelIn the beginning was the Wordalso from memory. And finally, the Homily of Saint Johnalso from memory. A young Greek monk from the Holy Mountain stood up in front of us and recited it with such infectious enthusiasm that we shall never forget him as long as we live. Saint John Chrysostomos himself seemed to speak through him to us and to the rest of the world as well! Cheering crowds of liberated survivors. There is a Russian Orthodox chapel at the camp today, and it is well known for its icon of Christ leading the prisoners out of the camp gates. The U.S. 7th Army's version of the events of the Dachau Liberation is available in Report of Operations of the Seventh United States Army, Vol. 3, page 382. Stevo Baich of Lackawanna, NY, was kind enough to share these funeral photos of Bishop Nikolai with us. Click lower right hand corner of photo to enlarge this page from the Lackawanna Anniversary Commemorative booklet. Thanks again, Steve! ﻿"In the words of the Psalmist: O Lord, what is man, that thou art mindful of him?—or with a little change: O England, what is Serbia, that thou art mindful of her? And the poor sons of Serbia, that thou visitest them? "A small strip of land with five million inhabitants and without seaboard. A peasant people devoted to agriculture and to nature, to the forest and cattle, to songs and tales. A past full of glory, of blood and sins. A present full of tears, pains and hopes. A king carried on a stretcher through the rocky desert of Albania,—a loyal parliament which refused to make a separate peace with the enemy even in the darkest hour of national tragedy,—an honest government which did everything possible to save the country, and which, when the country was nearly conquered, exclaimed through its President: "It is better to die in beauty than to live in shame! "—a fearless army, which for three years only knew victory, now watching in snow on the mountains of Montenegro and Albania, and lodging in the dens of wolves and eagles. Another army of old men, of women and children, fleeing away from death and rushing to death. Shall I say that is Serbia? "No: that is only a part of Serbia. "You have heard talk of Greater Serbia. I personally think that Serbia can never be greater than in this solemn hour of her supreme suffering, in which all the civilised world in both hemispheres trembles because of her catastrophe and sympathises with her. I personally love my little country just because it is so little; and just because its deeds are greater than its size. I am not sure that I should love it so much should it happen to become territorially so big as Spain or Italy. But I cannot help it; I must say that our Irridentists in Austro-Hungary are more numerous than our population in Serbia. Eight millions of our Serbo-Croat and Slovene brothers have been looking towards Serbia as towards their Piedmont, waiting their salvation from Serbia, as Alsace-Lorraine is waiting its salvation from France, and being proud of Serbia as all slaves are proud of their free kinsmen. All the slaves from Isonzo to Scutari are groaning under the yoke of an inhuman Austro-Magyar regime, and are singing of Serbia as their redeemer from chains and shame. Little Serbia has been conscious of her great historic task, to liberate and unite all the Southern-Slavs in one independent being; therefore she, with supreme effort, collected all her forces to fulfil her task and her duty, and so to respond to the vital hopes of her brethren. Shall I say that is Serbia? No; that is only physical Serbia. But there is a soul of Serbia. For five hundred years the Serbian soul suffered and believed. Suffering sometimes breaks the belief. But the Serbian suffering strengthened the belief of the Serbian people. With belief came hope, with hope strength; and so the Serbs endured the hardest and darkest slavery ever recorded in history, not so much by their physical strength as by the strength of their soul. Besides, it was a great temptation for the Serbs to abandon the Christian faith and to accept the faith of the Crescent. Under this condition only, the Turks promised freedom to the Serbs and equal rights. Several of the aristocratic families could not resist this temptation and became renegade to the faith of their ancestors in order to save their lives. But the mass of the people fearlessly continued to be faithful to the belief in the Cross. ﻿"We never fought indeed solely for a poor existence in this world. We fought always rather for the ideal contentment of this terrestrial existence. We fought not for life only, but for what makes one's life worth living—"For Cross and Freedom!" The Cross is mentioned first, and then Freedom. Why? Because the Cross of Christ is the condition of a real freedom. Or, because the Cross is for God's sake and our freedom is for our sake. We should fight for God's sake first and then for our own. That was the idea. Or, because Cross and Freedom are two words for the same thing. The religion of the Cross involves Freedom, and real Freedom is to be found only in the religion of the Cross. To listen to the whole "Heavenly Liturgy" by Saint Bishop Nikolai, visit the YouTube site of Prijatelj Bozlji. The letters to Milan Karlo and Proto Vlastimir Tomich from Bishop Nikolai were not previously published, so in brotherly/sisterly love and good faith, we place them here for others doing further research on the life of St. Bishop Nikolai. I would like to thank Proto Tomich's daughter-in-law, Betty Tomich, for sharing these letters with us. And also a big debt of gratitude to Fr. Mateja Matejic of Columbus, Ohio, for translating them. Betty Tomich's neighbor, Sarah Pesich, shows a photo of the Dedication of the St. Elijah S.E.O. Church in Aliquippa in 1956. The photo was taken by Milan Karlo. Sarah, a professional seamstress, was called upon to make the white robe for Bishop Dionisije. Afterwards, it was cut into small pieces and each priest got a piece of the robe. "If I would have known it wasn't going to last forever, I wouldn't have killed myself in making those tiny stitches by hand," 86-year old, but very alert Sarah laughed. However, it was Bishop Nikolai who had consecrated the grounds of St. Elijah Serbian Orthodox Church in Aliquippa several years earlier. "On January 27, 1952 at the St. Sava Celebration, the campaign was started for soliciting funds, pledges and planning for the new church. 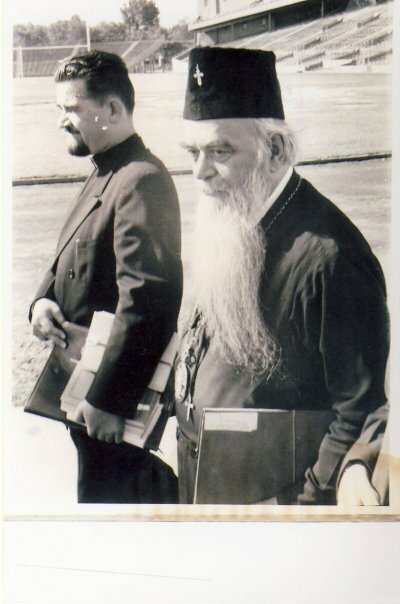 On June 1, the same year, Bishop Dr. Nicholai Velimirovich, assisted by our local Pastor V. Rev. 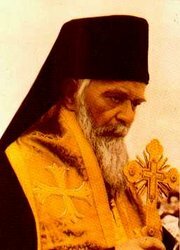 V. Tomich, and several Greek, Russian and Serbian Clergy blessed the ground of the new church." Here's +Betty Tomich in her home, showing a pencil drawing her very talented late husband, Jovan Tomich, drew of the tent they lived in when they were prisoners of war in Germany. He drew it entirely from memory of when he was a young child, remembering the experiences and hardships they endured. +Betty Tomich looking over one of the five letters from Bishop Nikolai to her late in-laws. +Jovan Tomich, Betty's late husband, was known throughout the USA for his vocal defense of the Serbs through his witty and artistic cartoons sent to newspapers, and his frequent calls to all the local and national radio and TV stations that were hell-bent on portraying the Serbs as the only belligerents of the war in Yugoslavia. John was relentless in fighting back. "We could never enjoy dinner in peace. He was always calling CNN about something or another. Madeline Albright and Richard Holbrook drove him crazy. Right away he would be dialing CNN and challenging their statements." John was brilliant in many aspects, including having a magnificent voice which he used in singing with the Pittsburgh Opera. John was also proud of his service for the Intelligence Branch of the U.S. Army during his younger days which utilized many of his talents, including his knowledge of many different languages. John was also the architect of record who won many national FIRST-PLACE awards from the Architects of America for his forward-looking church design of Holy Trinity Serbian Orthodox Cathedral of Pittsburgh. He worked for the prestigious Greene Engineering Company of Sewickley, PA and also had his own consulting business on the side. Wife Betty was gainfully employed as an executive secretary for U.S. Steel Company of Pittsburgh and is now enjoying retirement. UPDATE: Betty Tomich, born March 6, 1939, passed away on October 8, 2015. Her funeral was from the Greek Church in Aliquippa, but she was buried in the St. Elijah Serbian Orthodox Cemetery. Fr. Tomich was bon Sept. 23, 1894, in Vrbica, Shumadija, Serbia, located near the Villlage of Orasac, the place where Karageorge started the First Uprising in the year 1804. He graduated with Honors from the St. Sava Theological Seminary in Belgrade. He was a classmate of the late Bishop of Dalmatia, Dr. Iriney, and both were students of the late (Saint) Bishop, Dr. Nikolai Velimirovich. Upon graduation he worked on the Ecclesiastical Court in Belgrade and later was a teacher in Arandjelovac where he met and married his wife, the present Protinica Pola. Father and Mrs. Tomich has three sons. In the year 1934, Fr. Tomich was transfered to the Kragujevac Parish and was also an instructor of Religion in the Girl's Gimnazija. He was later appointed as the Bishop's representative for the City and County of Kragujevac. During the "Concordat Struggle" in 1937, Fr. Tomich began a newspaper called, "Pastirski Glas" and together with the well-known Re. Milan Sretenovic and Rev. Jovan Rapaich, this publication played an important role in the protection and defense of Serbianism and Orthodoxy. Respecting Fr. Tomich's national and religious work, upon the recommendation of the Serbian Patriarch, Bishop Nikolai of Zica elevated Fr. Tomich to an Arch Priest or "Proto," at the Cathedral in Kragujevac. In the year 1940, Proto Tomich volunteered his services to the Yugoslav War department in case of war to serve as an Army Chaplain. When war broke out in 1941, Proto Tomich was already on the front in Macedonia. Later, he was, together with the entire Shumadija Division, deported and interned in the prison camp in Germany and remained to the end of the war in 1945. During his internment in the Prison camp he served as the camp Chaplain and due to his religious and nationalistic beliefs was shifted several times. In the year 1944, Proto Tomich was transferred to the Officers camp Oflag XIII N, Hammelburg. At the same time, a group of American Officers who had earlier been interned in Ardeni on the French-German border were brought here. There were about 1,300 American officers that were brought to the camp and before long, they were shown the true Serbian hospitality and in the most tiring days in the lives of the American Officers, Proto Tomich together with the other Serbian prisoners, gave all they could to ease the situation and make them welcome and comfortable. The following year on March 27, one group of the Third American Army arrived and they were freed. Soon after, Proto Tomich (with other prisoners) was once again captured by the Germans and sent to the prison camp in Nurnberg where the same army freed him on April 17, 1945. Proto Tomich together with 1,101 Serbian officers refused to return to his native country which was already overrun and ruled with communists. After three months in Austria, Proto Tomich set out for Italy to find his family. Deeply saddened with the report that his second son, Milosh, was missing, Proto Tomich together with his wife and youngest son Jovan, arrived in America in March 1947 to assume the duties of parish pastor in Omaha, Nebraska. Two years later, he was unanimously elected by the local St. Elijah Parish and has served as its pastor since. At the same time, his oldest son, Miroslav, arrived from Germany. During the past seven years, the local parish has made great strides under the able leadership of Proto Tomich. The St. Elijah Coir, the Sunday School, and the Mothers Club as well as the Young Men's Organization has flourished well under his guiding influence. 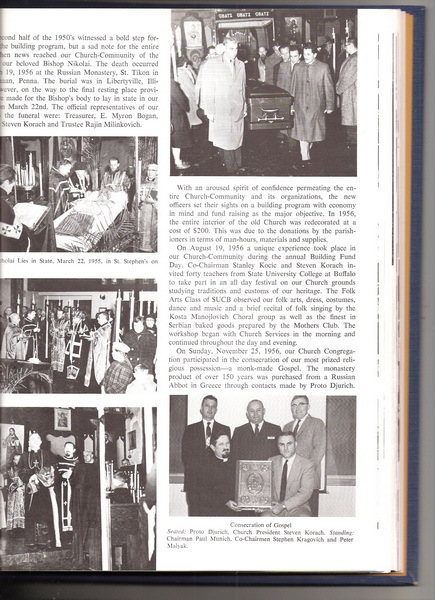 He was very instrumental in the reorganization of the Church Building Fund in December 1951 and has spent many hours working on the numerous details regarding the construction of the new church. 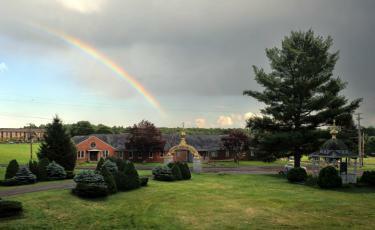 The entire activity of the St. Elijah Church has grown greatly under his supervision and his spiritual leadership. The result of this activity and the guiding hand of our pastor together with the aid and help of the various committees and the entire parish, was the burning of the mortgage in the sum of $110,000.00 in 1958, only TWO years after the completion of the new St. Elijah Church on one of the nicest sites in the community. It was intended that the debt be paid within fifteen years, but it was paid within two. Also here, as in other instances, Proto Tomich's ability to expediate played an important role. Nobody ever waited for him. In the execution of his duties he was always exact and prompt: at baptisms, weddings and funerals, visiting the sick and in emergencies he tried to arrive on time and in time--day or night. His exactness is shown in the church records which contain numerous data about the living and the deceased, and about the number of those who received the Holy Sacraments of Confession and Communion. The credit for the number of those who were converted into the Orthodox religion from other denominations goes to Father Tomich for his successful work and for the esteem he enjoys in the community. 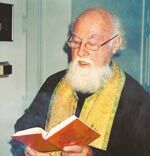 Briefly said, the Serbian Orthodox Church Congregation of St. Elijah, under the able guidance of Father Tomich, has prospered spiritually and materially for the time of his service. Fr. Tomich's legacy was to unselfishly promote materially, culturally, and above all spiritually, the welfare of the members and organizations for the good of America and the Glory of God. Father of the bride, Milan M. Karlo took this photo in the church following the wedding of Gus and Milana K. Bizic in 1963 officiated by the V. Rev. Fr. Vlastimir Tomich in St. Elijah Serbian Orthodox Church in Aliquippa, PA. The table was built by Peter and Joe Bizic (father and uncle of the groom) in memory of Fr. Tomich's son who died in the war, and the late Bishop Nikolai. Inside, where the marriage crowns are kept, is marked the special wedding date uniting the Karlo/Bizic families. Because there were several other activities going on at the church the same day, this table was only brought in by Pete and Joe Bizic only 1/2 hour prior to the wedding, so that Pete's son, Gus, and his wife Mim, would be the FIRST to walk around the little altar table, taking their first steps together as man and wife in an unending circle three times, following in the footsteps and path of God. 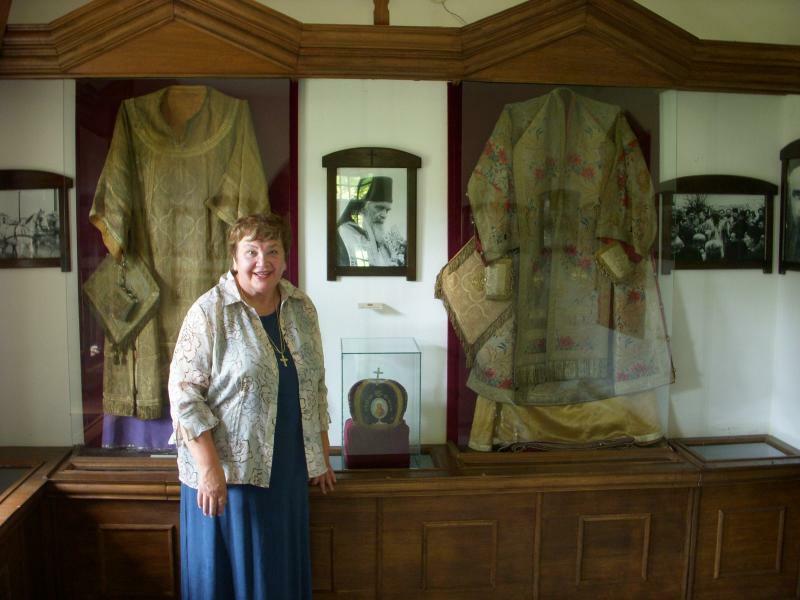 Peter Bizic can be seen on the photo above with Bishop Nikolai and Proto Tomich when visiting the SNF. I daj mir onom ko u njemu ostaje. Бозе благослови оног ко улази у овај дом, засхтита и сацхувај оног који излази ис њега И дај мир оном ко у њему остаје. "God bless those who enter into this home, Protect and keep in your Grace those who leave from it, and grant peace to those who in it dwell." Have you ever brought a Badnjak into your home? Do you know that the Badnjak is the finest and foremost custom of all the many traditions by which our people enhance the Christmas celebration? The Serbs begin the celebration of Christmas with the solemn ceremony of bringing in a young OAK tree to the house. An OAK is usually the most solid tree and produces the most heat. Have you ever anointed the Badnjak with honey? Have you rejoiced with your children watching its light emitted in a swarm of sparks? Have you enjoyed its heat? The Badnjak is the tree of happiness and sweetness, the tree of health, strength and youth, the tree of life and love. Is there a tree of happiness in this world? Is the Badnjak that tree or is it a semblance and symbol of that tree? Yes, it is only the symbol and semblance. The real tree of Happiness is HE Who was born on that radiant day. The bringing of the Badnjak into the house represents Christ's coming into the world and His coming into our homes and our souls! What a glorious custom and marvelous scene! The Badnjak represents Christ. As a young and powerful tree the King of Love gave Himself to be slain in order to rejuvenate the world by the fragrance of eteral youth; to thaw a frozen mankind by the fire of His love; to enlighten and bring joy to all men by the flame of His Divine Revelation; to annihilate the false Gods on earth by the sparks of His words; to sweeten the bitter waters by the sweet juice of His blood. Having brought the Badnjaks into your homes, have you brought Christ into your homes and your souls? A picture is only a picture, but Christ is the reality. The Badnjak is a picture of the tree of happiness and as a picture is a warning and reminder that you should bring into your homes and your souls the real tree of Happiness, the Son of God, our Lord, Jesus Christ. His teaching, His sermon on the Mount was the sermon of Happiness and contains the only charter human happiness. He Himself represents the true and eternal Tree of Happiness. He said that he dreamed of being there from the age of 14. "I have to thank you for many sacrifices that the people of this country have made for Serbia during the present world-struggle. Many of the English nurses and doctors died in Serbia in trying courageously to save Serbian lives in the time of typhus-devastation. They lost their own lives saving ours, and I hope in losing their lives for their suffering neighbours they have found better ones. Their work will never be forgotten and their tombs will be respected as relics among us Serbs. Besides, Great Britain also sent military help for Serbia. It was dictated to Great Britain by the highest strategic reasons to send troops to Serbia, to the Danube, in order to stop the Germans there, to hinder their junction with the Bulgars, to annihilate all their plans and dreams regarding the East, to defend Serbia not only as Serbia, but as the gate of Egypt and India, and so to protect in the proper place and in the most efficacious manner her oriental Dominions. But seemingly England sent her troops to Serbia more to protect her honour than her Dominions, more to help Serbia than to defend Egypt and India. The number of these troops and the time when they arrived in Serbia indicate that. Hundreds of miles the Serbs had been driven back by the enemy before the British forces reached the Serbo-Greek frontier. But still they reached the Serbian land, they fought on Serbian soil and shed their noble blood defending that soil. It is better not to be born than to misuse life. A king asks another king: How many people do you govern? But if God speaks to a king, he asks, "How many people are you helping? It is better to dress the soul in silk and the body in rags than the reverse. If life does not mean work, then life is worth nothing. Work and virtue are sisters, as well as idleness and vice. "When Richard the Lion-hearted sailed from England to the Holy Land, not to fight for the national existence, as we to-day speak of it, but to fight for the most unselfish and idealistic aim, for Cross and Christian Freedom, Serbia was already opening a great epoch of physical as well as spiritual strength. Our king Nemanja, the founder of a dynasty which ruled in Serbia for nearly 300 years, had heard tales and songs about the English king with the lion's heart, and had helped the same cause, the cause of the Crusades, very much. His son, Saint Sava, organised the Christian Church wonderfully, and wonderfully he inspired the educational and scholarly work in the state created by his father. This Saint Sava, the Archbishop of Serbia, after he had travelled all over Serbia, Greece and Bulgaria, preaching the Gospel of the Son of God, died in Bulgaria. His body was transferred to and buried in a monastery in Herzegovina. Afterwards, in times of national hardships and slavery, great pilgrimages took place to the grave of the Saint, which became the comforting and inspiring centre for the oppressed nation; the Turks destroyed the tomb, carried the body over to Belgrade and burnt it, in order to lessen the Serbian national and religious enthusiasm. The result was just the contrary.